The asteroid, known as 2014 JO25, was discovered in May 2014 by astronomers at the Catalina Sky Survey near Tucson, Arizona—a project of NASA's NEO Observations Program in collaboration with the University of Arizona. (An NEO is a near-Earth object). Contemporary measurements by NASA's NEOWISE mission indicate that the asteroid is roughly 2,000 feet (650 meters) in size, and that its surface is about twice as reflective as that of the moon. At this time very little else is known about the object's physical properties, even though its trajectory is well known. The asteroid will approach Earth from the direction of the sun and will become visible in the night sky after April 19. It is predicted to brighten to about magnitude 11, when it could be visible in small optical telescopes for one or two nights before it fades as the distance from Earth rapidly increases. 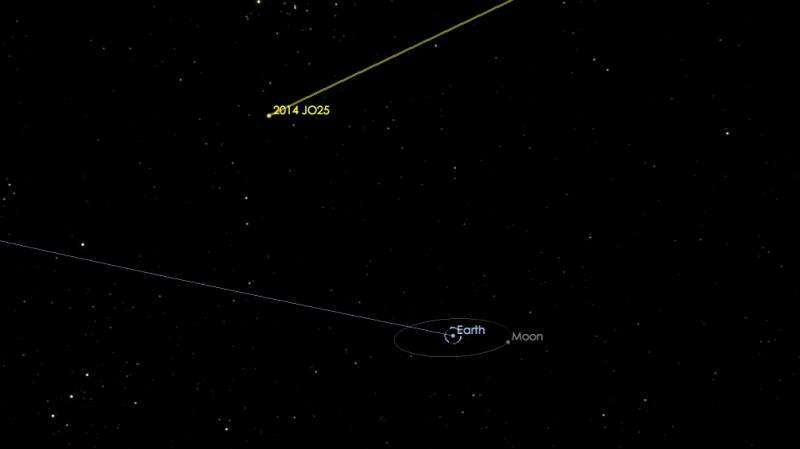 Small asteroids pass within this distance of Earth several times each week, but this upcoming close approach is the closest by any known asteroid of this size, or larger, since asteroid Toutatis , a 3.1-mile (five-kilometer) asteroid, which approached within about four lunar distances in September 2004. The next known encounter of an asteroid of comparable size will occur in 2027 when the half-mile-wide (800-meter-wide) asteroid 1999 AN10 will fly by at one lunar distance, about 236,000 miles (380,000 kilometers). The April 19 encounter provides an outstanding opportunity to study this asteroid, and astronomers plan to observe it with telescopes around the world to learn as much about it as possible. Radar observations are planned at NASA's Goldstone Solar System Radar in California and the National Science Foundation's Arecibo Observatory in Puerto Rico, and the resulting radar images could reveal surface details as small as a few meters. The encounter on April 19 is the closest this asteroid has come to Earth for at least the last 400 years and will be its closest approach for at least the next 500 years. Also on April 19, the comet PanSTARRS (C/2015 ER61) will make its closest approach to Earth, at a very safe distance of 109 million miles (175 million kilometers). A faint fuzzball in the sky when it was discovered in 2015 by the Pan-STARRS NEO survey team using a telescope on the summit of Haleakala, Hawaii, the comet has brightened considerably due to a recent outburst and is now visible in the dawn sky with binoculars or a small telescope. The illustration showing this asteroid's present proximity to earth is pretty close to the area in which the James Webb Telescope will be orbiting the Sun.